Description: Pianist Richie Beirach may be known for his heady attempts to fuse jazz and classical music through improvisazion. For this latest release from Venus Records, Beirach and his bandmates -- George Mraz and Billy Hart -- went into the studio and simply exploded with their passion for straight ahead jazz. Beirach has been teaching jazz in Germany since 2000, but he had no problem reuniting with his friends of more than 30 years. They had no rehearsals, and seven of the ten selections were first takes. Beirach's joy of coming home to New York and playing with stellar sidemen is palpable. From the surprisingly fast opening number "You Don't Know What Love Is" to the final cut "Foot Prints" the energy level is constantly high and all three musicians are inspired throughout. 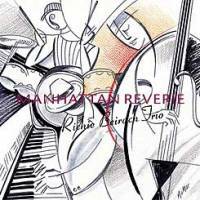 This is one of the most satisfying piano trio CDs I've heard in recent years. Recorded at The Studio in New York in March 2006 by Katherine Miller; Venus Hyper Magnum 24-bit mastering; Swing Journal Gold Disc; Winner of 2006 Swing Journal Jazz Disc "Silver" Award; Gate-fold paper sleeve edition.